When it comes to bathtime, I reckon kids fall into one of two categories – either love it or hate it. My kids are in the ‘love it’ group and could happily while away hours turning ‘pruney’ in the bath. I know other kids who run shrieking as soon as they hear the water running and all hell breaks loose if it’s a hair-washing night. 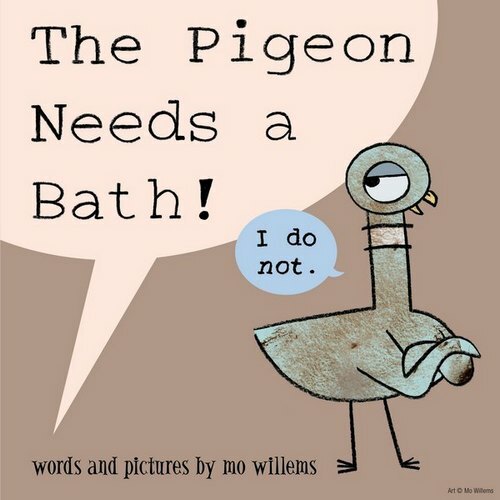 Much-loved author Mo Willems has tackled the love and hate relationships kids have with baths with his well-known character, Pigeon, in his latest book, The Pigeon Needs a Bath!. Pigeon is adamant that he doesn’t need a bath – “‘Clean’. ‘Dirty’. 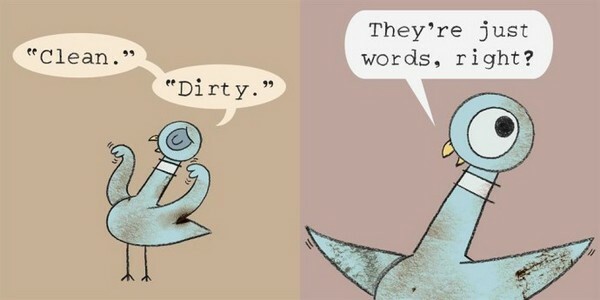 They’re just words, right?” Apparently not because Pigeon looks filthy. And there are flies buzzing around him. And he smells. After a little reverse psychology, Pigeon agrees to take a bath and it’s not difficult to guess what happens next (hint: Pigeon quite likes that clean feeling). As always, Willems’ dry sense of humour is perfectly executed in the character of Pigeon. The highlight of this latest story is Pigeon’s brilliant stalling tactics when it comes to actually getting in the bath – it’s too hot, it’s too cold, it’s too lukewarm, it’s too deep, it’s not deep enough, there are not enough toys, there are too many toys, it’s too wet and lastly, my favourite, “Too reflective…”, accompanied by a picture of Pigeon staring at his reflection in the bathwater. 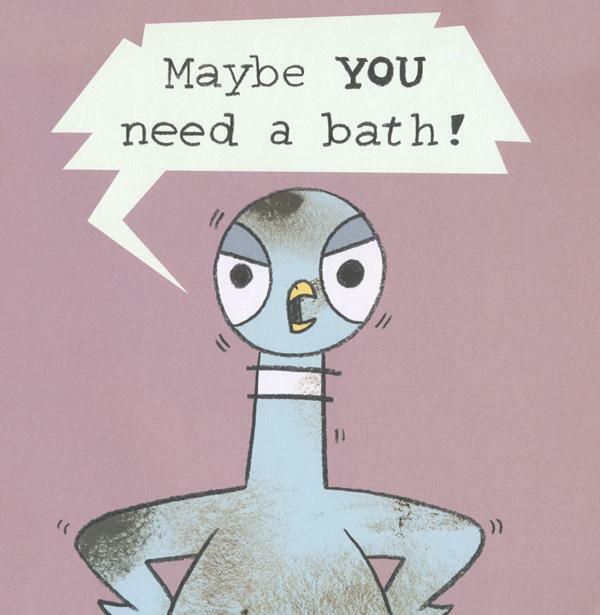 The Pigeon Needs a Bath! is available in all good book stores or online from Book Depository. For more by Mo Willems, see our previous posts.